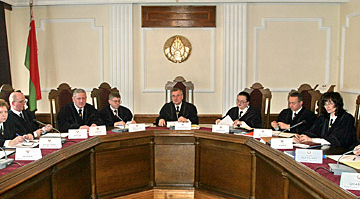 Homel pro-democratic activists Uladzimir Katsora and Uladzimir Niapomniashchykh have addressed the Constitutional Court of Belarus with a demand to provide legal assessment to the provisions of Article 8.4 of the Code for Administrative Procedures in their compliance with Article 25 of the Constitution and Article 9 of the International Covenant on Civil and Political Rights. The address says that Homel police detained several local residents on 7 and 8 October and charged them under Art. 23.34 of the Administrative Code (violation of mass events restrictions). After their detention, they were taken to prison and later convicted by Homel courts. “The issue of our detention was ignored by the courts. We believe that the police violated our Constitutional guarantees provided by Article 25 of the Constitution. Therefore, we appealed the verdicts at Homel Tsentralny District Prosecutor’s Office, who however said that the detention was a measure of implementation of the administrative procedures, with our status defined then as persons who had committed an offence. The Regional Prosecutor’s Office later upheld the conclusions of the district prosecutor, saying that administrative detention could not be applied after the pronouncement of a court ruling on the administrative offence”, says the activists. Uladzimir Katsora and Uladzimir Niapomniashchykh argue that administrative detention is not an obligation, but a right of policemen, and the legal provision of “can be detained” was in this case used with the biased opinion of the police. They also stress that the wording “a person who has committed an offence” mentioned in Art. 8.4 has no legal explanation, running counter to the presumption of innocence, as provided by Art. 2.7 of the Code for Administrative Procedures. “We believe that the above-mentioned irregularities of the administrative procedures resulted in the violation of our right to freedom and personal integrity”, say the activists.